The MasterPure™ Complete DNA and RNA Purification Kit offers a user-friendly protocol for total nucleic acid (TNA) purification. Users then simply treat their TNA with RNAse or DNAse to be left with pure DNA or RNA, respectively. Quick precipitation/washing steps are then used to remove the nuclease. The RNA purification protocol is designed to purify all RNA including small RNAs (miRNA, lncRNA, etc.) that cannot be purified by most column systems. 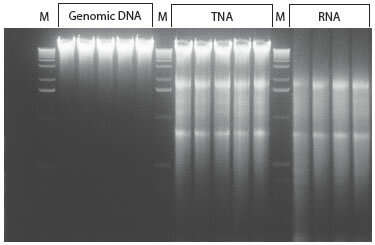 Among available kits, the MasterPure™ Complete DNA and RNA Purification Kit is the most versatile, enabling DNA or RNA purification from a variety of samples: Whole blood, plasma, buccal cells, liver, mouse tail, kidney, saliva, cell lines, paraffin-embedded tissues, Guthrie cards, mouse tail, corn, geranium leaf, E. coli, and lambda phage. Still wondering what DNA or RNA purification kit to choose? Consult Epicentre’s selection guide or contact your local distributor for advice. Legal notes: TRIzol® is a registered trademark of Life Technologies. RNAzol® is a registered trademark of Molecular Research Centre, Inc.